Fluffy...Flaaffy! Pokemon One a Day, Series 2! 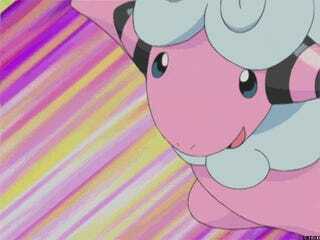 Yesterday's Mareep could put a brother to sleep if they looked at it too long. 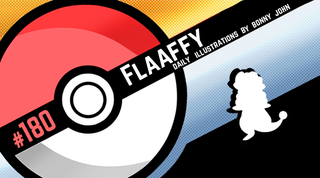 Today on One a Day, those poofy cloud curls evolve into something a bit more in Flaaffy! From a yellow sheep to an upright pink sheep, let's take a closer look on how my Flaafy came to be! One a Day offers many challenges to ya boy Bonnyjohn aka Jack Bauer aka Big Boss aka this could go on forever. One of those challenges besides releasing these to a deadline is to of course work in a new style each day. Where I get styles is part of my life as an artist - pretty much whatever comes my way can be inspiration. Today's take on Flaaffy bores inspiration from concept art for the Disney Pixar film Brave! Random, I know! But such is the nature of how art is all about give and take. Nothing in this world was created without evolving from something else. Especially for One a Day, I keep my eyes peeled for styles that really catch my eye and could make for interesting bases for me to create illustrations for. So Merida from Brave has all these insane curls. One of the concept art showcased her beautiful red hair in such a style I thought would be fitting for Flaaffy - it's as simple as that and translating it to fit a sheep and not a human being. As this midway form cuts down on the wool, the separation of curly elements to the gradient shading for the body creates a work that really vies for your attention. I hope you guys are captivated by all the pink, and then break it down to enjoy and follow all the waves of wool that make up the hair and chest piece. The limited palette really keeps the piece tight and where no dynamic pose is involved, the elements of design can keep things dynamic in place. Where do you find the inspiration for what it is you do?